In games, especially those when we are housed within an avatar, we are often granted a set of hands to work with. With them, we connect with a multitude of other virtual objects to accomplish our goals. Situating an actual hand into the virtual world would require an emulation of its complex mechanisms. This can be done by obtaining both the position of one's arm and the movements of its hands. consisting of an array of Muscle Motion Sensors and an Accelerometer-Gyro sensor. In this tutorial, we will gain understanding of UnlimitedHand's Input Technology. An array of Muscle Motion Sensors are arranged on a V-shaped resin sheet to match with the position of key forearm muscles (Figure 1). This enables the UnlimitedHand to optically read in the motion of your forearm muscles to deduce the movement of both hand and fingers. Figure 1. Arrangement of Muscle Motion Sensors (When used on the Right Hand). one may track 3 main types of movements performed by the hand, see (Table 1). Check Step 4. from this tutorial to make sure you are collecting Serial values from the device. Figure 2. Correspondence between Serial Values and Muscle Motion Sensor Location (When used on the Right Hand). The three movement types: Finger motion, Ulnar/Radial deviations and Wrist motions. can monitored by addressing different combinations of Muscle Motion Sensor values. Note: The information listed in the following table applies only when worn on the RIGHT HAND. 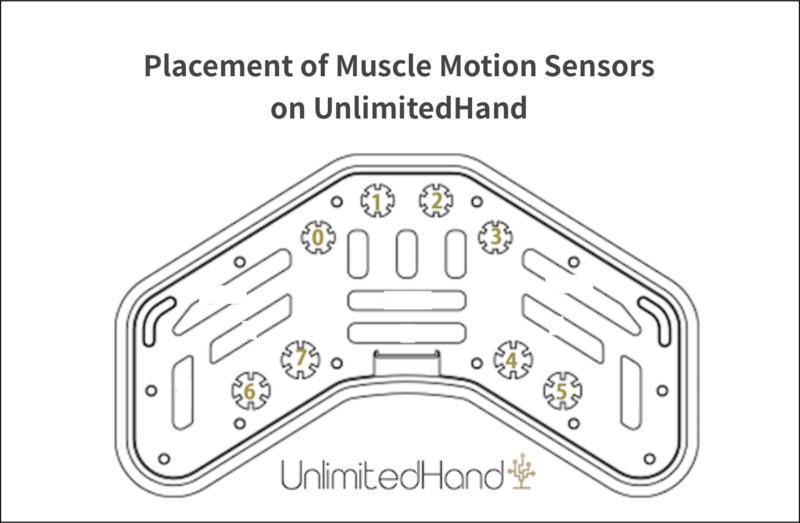 As long as the UnlimitedHand is firmly strapped to your forearm, an Accelerometer-Gyro sensor embedded inside the main case of the device is able to track maneuvers and the position of your arm. Motions tracked can then be transferred into games to achieve real time interactions. Hackers of the UnlimitedHand may call the following functions to read in 3 dimensional Acceleration values representing maneuvers, as well as 3 separate angle values representing the orientation of your arm.